As we speak, 150 top-notch professional athletes are gearing up for a grueling 124-mile challenge. 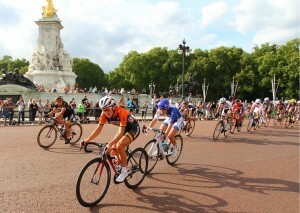 The Prudential RideLondon Festival this weekend will end in a nail-biting race. Sir Bradley Wiggins and Mark Cavendish will be heading the field in the RideLondon-Surrey Classic. Live coverage from the BBC will capture the event that will begin in central London, heading out to the Surrey hills before turning back to the finish line on The Mall. It seems we Brits love our cycling! Whether you’re a professional cyclist or an enthusiastic amateur, there are events all over the country that offer the chance for you to get on your bike and challenge yourself. Cycling is a growing sport within the Services too. We spoke to Captain Bren Reece, to get the low-down on his love for competitive cycling and to learn how to train for a big race; military style! What sort of cycling events do you get involved with, Bren? Over the last 3-4 years I’ve focused on triathlon and cycling events. Being out on the bike gives you a greater sense of freedom and adventure. Events I’ve done done previously range from sprint triathlons to Ironman sports. Two weeks ago I did Challenge Roth (3.8k swim, 180k bike, 42k run) in Bavaria, which was an amazing experience, competing in a race that is legendary in the triathlon world. 3000 places sell out in less than a minute! This weekend I did a 12-hour mountain bike race as a pair in Plymouth. How do you train for a cycle marathon? Be consistent and regular with your training, rather than going big and less often. Build up your training slowly to avoid injury. Don’t take unnecessary risks. If it’s icy go out on a mountain bike not a road bike. Mountain bikes help to improve your handling skills. Use them as part of your training program. Hill reps are painful but necessary. Concentrate on good nutrition – both on and off the bike. Build in recovery time – take rest days to help your body make gains and ensure good sleep. Cross-train by doing circuits, swimming and core strength exercise. You need to be strong all over when cycling for long periods. Never try anything new on an event. Stick to what you know. Ride your own race. Do what you’ve trained for and don’t be tempted to go with faster riders or to set off too hard too early. Pace yourself if you want to complete the course. Set shorter goals to maintain motivation and enter something different in the winter. What drives you to challenge yourself? The feeling of achievement can’t be under-estimated. Whether it’s a personal challenge or doing something with friends, each event offers something new. Be careful though, having completed some extreme endurance events, they can leave you embarrassingly emotional at the finish! I would like our children to grow up thinking that eating well and exercising is the norm. They love to ride their bikes and often play at racing and training. Job done! Has your military training helped you in taking on these kinds of challenges? Without a doubt military training has helped. It not only makes you physically and mentally stronger but soldiers generally have better admin. Sourcing equipment, logistics and demonstrating time management are all good practise. Looking after your kit is key. Everything has to be tried and tested. Executing a decent race by eating, drinking and planning means you stand a better chance of doing well and finishing. Military circuits and lunchtime physical training are important cross-training activities. People pay a lot of money for both the chance to be pushed and the facilities we have. Wattbikes are a great addition to the gym from my perspective as both a cyclist and keen fitness freak. Which aspect of racing do you enjoy the most? Riding early in the morning when everyone else sleeps means you see more and feel great for the rest of the day. Being up before the rat race becomes addictive! What advice would you give other people who are considering taking on a cycling marathon in the future? Get involved. Even if you are not competitive, riding events allows you to access places you wouldn’t normally get to go. I hope you feel inspired; I’m off to tug the dustsheet off my bike and take it for a spin! The Military Mutual wishes Captain Reece the very best of luck on his next challenge. If you’d like to learn more about cycling events near you, go to the British Cycling website. For information on the Wattbikes visit www.wattbike.com/uk. We specialise in insurance solutions for the serving & military families. Get a quote for Military Home Insurance, Military Kit Insurance & Car Insurance or call our UK contact centre on 0800 0882 966.